Yes, the quality of all your veterinary dog kennel panels matter, but when it comes to feeding, walking, cleaning and handling your patients, your kennel doors take center stage. Your team may be opening and closing the kennel doors dozens or even more times a day. We get that. That’s why our TriStar Vet team has designed exceptional options — all with easy one-hand operation; in-out swinging for complete flexibility; no bottom rail to trip over or trap urine, feces or fur; and custom configurations for any space (even a narrow corner can become a dog kennel!). 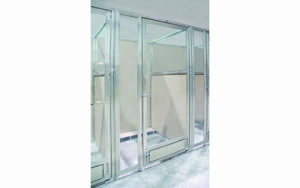 Our stainless steel rod doors are welded to the bottom frame so urine, water and bacteria will not get trapped inside the frame. These grill doors are made of ¼” stainless rods passing through stainless steel banding, then welded to the dog kennel panels to prevent rattling and increase strength. 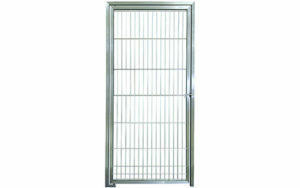 Our clear tempered glass kennel doors provide a luxurious open-boarding look without sacrificing durability. Our ¼” tempered glass doors reduce noise, and decorative door handles add luxury boarding appeal. Rain dog panel kennel doors hide nose prints by distorting the glass, yet create a sense of openness by allowing light to show through. This 36″ high rain panel eliminates the urge to constantly clean the bottom glass door while it offers privacy to even taller dogs. 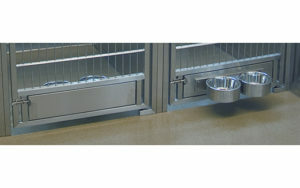 Add our kennel door rotating bowl feeder panel to any door for easy and safe access to food and water. Two stainless steel bowls rotate 360 degrees to simplify feeding. Discover how the right veterinary dog kennel doors can make all the difference.